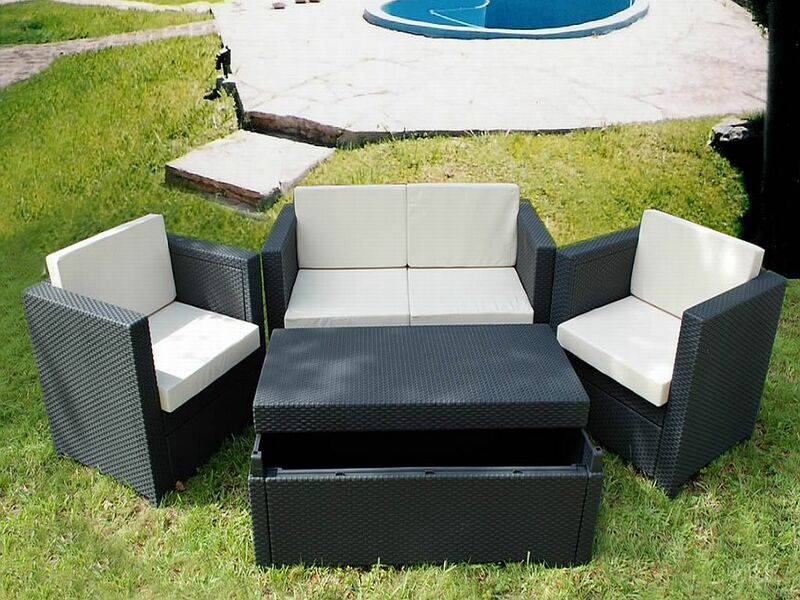 The Rimini 4 piece 100% resin wicker furniture set is a rattan style furniture line that combines modern design and technology with traditional wicker patterns. This durable weather resistant resin will never unravel. The non-metallic frame will not rust or decay, which makes this set ideal for all outdoor areas, including the beach. 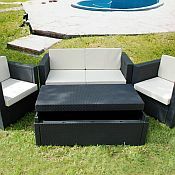 The Rimini set has a natural looking, open weave design, thick comfortable cushions, and is virtually maintenance free. The multi-purpose coffee table can also be used as a storage box for the cushions. Whether you are decorating your backyard living space or beautifying a commercial setting, this set will add flavor to your outdoor rooms. The Rimini 4 piece 100% resin furniture set will provide years of enjoyment, comfort, and versatility. Avilable in two frame colors. Both frame colors come with water repellent, off-white cushions made of 100% polyester. This handsome set is backed by a 2 year manufacturer's warranty. The entire set ships in 1 box.